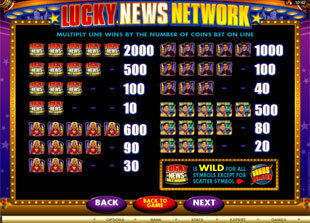 Lucky News Network Slots is a 5 reel 20 paylines video game released by Microgaming. In case you like TV and dream about reporter career, this slot can be quite interesting for you. With the top jackpot of 2,000 coins that can be increased up to 10,000 coins during bonus game, Free Spins with impressive multiplier and some attractive bonus feature, this slot is really exciting to play. Enjoy the bright graphics and amazing sound effects that invite you into the every day life of mass media people. 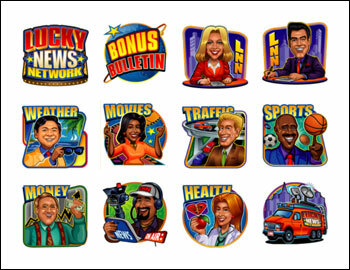 Such colourful and animated icons as Lucky News Network Logo, Male Newscaster, Female Newscaster, Weather Man, Traffic Man, Movies Woman, Sports Man, Money Man, Health Woman, Camera Man, Broadcasting Van, Bonus Bulletin help you to win the best awards. You can choose among such coin sizes as $0.01, $0.02, $0.05, $0.1, $0.2, $0.25. In other words, playing this penny slot the minimum bet that allows you to play with all 20 lines is $0.20. The maximum bet of this game is $100. 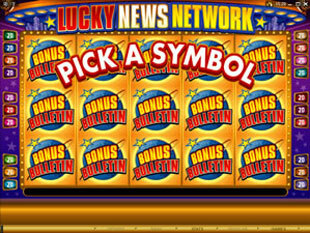 The highest jackpot is 2,000 coins or $10,000 for 5 Lucky News Network Logo. The second jackpot is 1,000 coins or $5,000 for 5 Male Newscaster. The third highest jackpot is 600 coins or $3,000 for 5 Female Newscaster. Lucky News Network Logo is the wild symbol. It can substitute any other icon except the scatter to produce more winning combinations for you. What is more, this icon can present you the top jackpot of this game that is 2,000 coins or $10,000. Just be lucky enough to get 5 of them on the reels and get your award. The Bonus Bulletin is the scatter symbol. Get 3, 4 or 5 Bonus Bulletin icons on the reels and multiply your total bet by 5, 10 or 50 times accordingly. Thus, you can win up to $5,000 per spin if bet maximum $100. Bonus Bulletin Feature. By hitting three or more Bonus Bulletin icons on the reels you activate Bonus Bulletin Feature that can present you 20 Free Spins with 5x multiplier or instant bonus up to 157x total bet. All you need is to choose one of 15 Bonus Bulletin symbols appearing on the reels to reveal your prize. Thus, in case you win Free Spins with multiplier, you can get up to 10,000 coins or $50,000 for 5 Lucky News Network Logo this time. On the other hand, if you play with maximum bet $100 and get 157x total bet you will be awarded with $15,700. 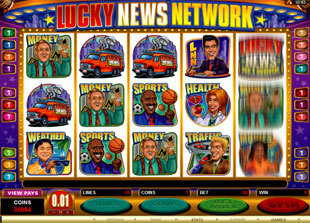 Lucky News Network slot machine is an amusing game with funny heroes and impressive prizes. Try to activate bonus feature that can present you Free Spins and win the top prize of this game that is 10,000 coins or $50,000.